It can be difficult to navigate the world of storage. It's hard to find enough space in your home and time set aside to truly achieve storage success. That's why it's best to enlist the help of the experts at California Closets of Miami to handle your storage solution needs - whether it's in the closet, garage, playroom or somewhere else. We offer a wide variety of storage options for your home in Miami. Here are a few examples. - Deep custom-designed cabinetry stores everything from seasonal décor to sporting goods to tools. 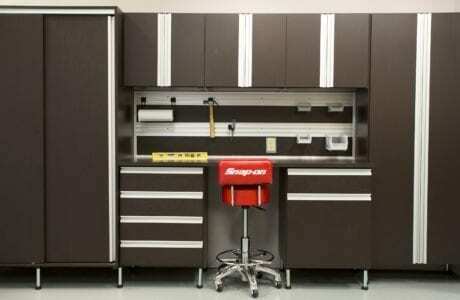 - Durable drawers hold smaller items, including workshop accessories such as nails, screws and sandpaper. - Baskets provide easy access to items that are often needed, such as baseball gloves and balls or gardening supplies. - A Fusion Track Wall System holds anything from large tools to auto equipment. - Deep countertops offer a large work surface area. - Window-seat shelving creates a perfect nook for reading with storage for books underneath. - Small storage areas and cubbies ensure that small items always end up in their proper places. Schedule your complimentary in-home design consultation today to get started.